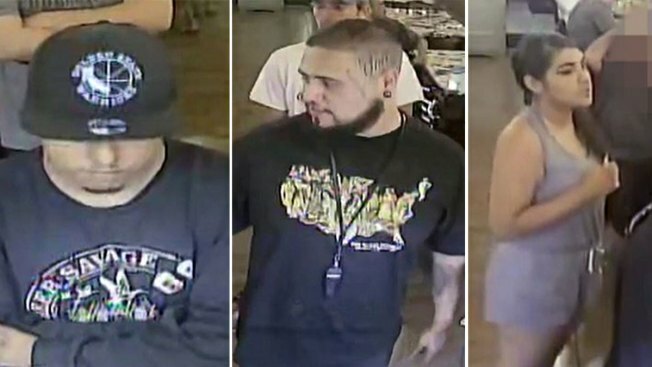 San Jose police are asking for the public's help in identifying and finding three attempted murder suspects believed to be connected to a shooting that broke out outside a taqueria in August. Following an argument on Aug. 9 at the La Victoria Taqueria located at 5015 Almaden Expressway, a suspect opened fire outside the restaurant, striking three men and sending other bystanders, including a child, running for cover, according to police. The three victims were taken to a local hospital to be treated. Based on a preliminary investigation, the victims and two adult male suspects became entangled in an argument while they were inside the taqueria, police stated. After the group walked outside, one of the suspects pulled out a handgun and started shooting, according to police. The suspect who opened fire is described as a man between the ages of 20 and 30, approximately 5 feet 5 inches to 5 feet 7 inches tall and anywhere from 165 to 185 pounds, according to police. A second male suspect was said to be between 20 and 30 years old, about 5 feet 9 inches to 6 feet tall and 195 to 215 pounds, police stated. A third suspect was described as a female between the ages of 18 and 25, anywhere from 5 feet 3 inches to 5 feet 5 inches tall and 145 to 165 pounds. Anyone with information regarding the case is asked to contact Detective Justin Jantz at 408-277-3835.